Recently moved over from VLC to MPC-BE x64 and am wondering if it's possible to create custom aspect ratios while using the latter? 2.21:1 specifically - VLC had this ratio among others available as standard but BE's list of presets doesn't seem quite as exhaustive. Is it currently possible with the player? Many thanks. Look in the menu after opening the file. View -> Pan&Scan -> Edit. Could you perhaps specify what should be entered here in order to achieve the 2.21:1 ratio? I'm a little lost. Use the keys on the numeric keypad, adjust the frame, see the values in the status line. Doing so allowed me to adjust to "2.22" - which is ever so slightly narrower than 2.21, but close enough! Just out of curiosity - what display do you use? I switch between a 65" Hisense LCD and a 60" LG Plasma depending on which room I'm in at home. Why do you ask? What is the purpose of that custom aspect ratio? I never used one by myself. 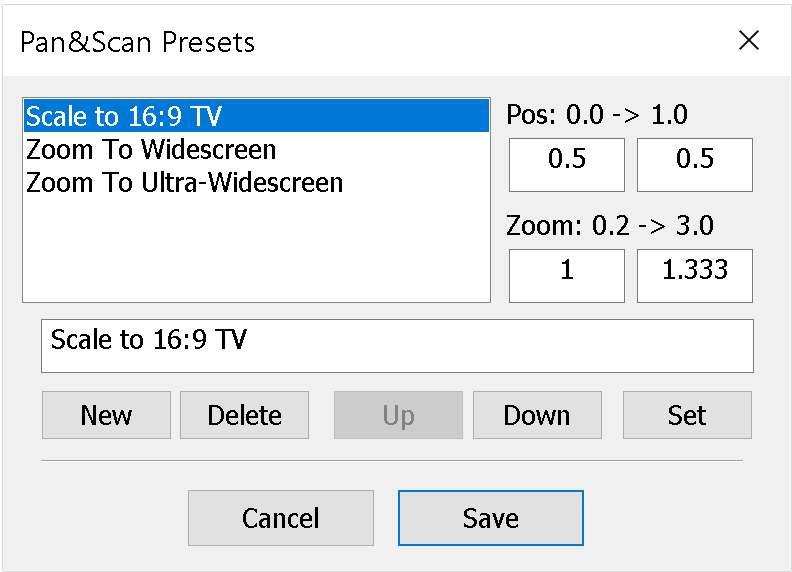 It's a preset ratio available with VLC I've simply used for years when watching many films. It lessens the amount of black bar on screen without stretching the image to the point where it becomes (in my opinion, anyway) detrimental.